After the Kiss sounds remarkably similar to "How to Lose a Guy in 10 Days," but the two manage to remain unique in their own spheres. Julie and Mitchell, the romantic leads of this novel, are so much more than they appear and their rocky road to love - full of unexpected surprises - was infused with both depth and swoon. While - granted - the misunderstanding in this novel can be seen from the synopsis itself, this book is more about a guilty pleasure read; the product of a rainy day, aching feet, and a Kindle nearby. It's funny, heart-felt, amusing, and oh-so-entertaining. As long as I love the characters in a romance, chances are, the book has already sold me. If you're looking for a new romance author - one who certainly delivers in the character development department (not to mention handsome hunk!) - then look no farther than Lauren Layne! I've struggled a lot with this review, mainly because so much that I want to say about this novel is a spoiler. 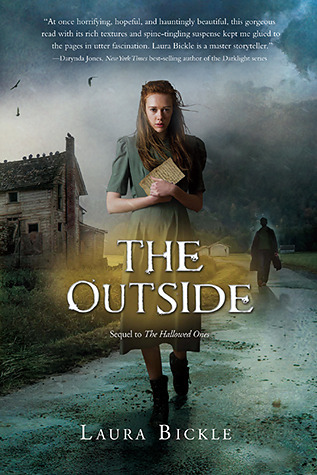 And yet, let me reassure fans of The Hallowed Ones first: The Outside is a remarkable follow-up to the creepy, vampire-infested Amish story we were given last year. Although Bickle has strayed away from the Amish community that was once her setting, the values of these people are still very much alive and present throughout the novel in the form of Katie, our protagonist. Moreover, where I could scarcely see a solution to the problems presented within this series, Bickle creatively wraps up this duology perfectly, presenting solid solutions and leaving no threads un-explored. For me, The Outside got off to a bit of a slow start, struggling to really find its voice in Katie's narration until nearly a quarter of the way through. Once it hit its stride, though, it was impossible to put down. While the bulk of Katie's growth remaining in The Hallowed Ones, she continues to adapt to her environment - while retaining her values - in this installment. In particular, her romance with Alex is intensely developed; slow, but true. The Hallowed Ones touched upon their connection, but The Outside really solidifies what they have into something real. Additionally, I love that there is both an influx of new characters and a return to old characters in this installment. Bickle goes back to fix the issues caused by Katie's hasty departure, as well as explore the lore and world she has created with her vampiric disease. Although she doesn't bring up nearly as many intriguing topics to mull over as she did in The Hallowed Ones, creating a divide between the spiritual and science, she does manage to make readers truly think and reflect with this installment as well. Bickle isn't afraid of exploring the boundaries of her Amish protagonist, which I love, so all-in-all, this novel wound up being just as strong - if not even more memorable - than its predecessor. I didn't even realize that The Hallowed Ones is a duology! Clearly I'm an idiot and now I have no excuses left for waiting to read it.I'll wait for my Audible credit to come through and get book 1 that way. And I was just in the mood for some romance myself, just not this type, so I went for steampunk. This sounds fun, though! The Outside's cover reminds me of an edition of The Book Thief, am I the only one? Great to see hear that the book picks up after sometime. Worst type of disappointment when it just keeps on going, dragging the whole time. I strongly believe that soon enough I'll start reading romance novels just because of Rachel's reviews. She really enjoys the genre but I'm too scared to really try it out. I'll have to. But The Otherside is totally my genre :D I must read it soon and I'm so happy you enjoyed it. A huge YAY For a remarkable sequel Keertana! That makes me so happy, outstanding sequels seem to be few and far between lately, so it's nice to see such a high rating for The Outside! I haven't read The Hallowed Ones, but vampire lover that I am, I plan to for sure! Also, I adored How to Lose a Guy in 10 Days, so I'm definitely adding After the Kiss to my list! I read some of your reviews! Really like them and your blog. Keep it up. Hm... looks like I'm going to have to add Lauren Layne to my romance author list. As far as Laura Bickle's books... oh I so need to get to this series. This sounds fab. I don't mind a slow start to a book as long as it captures me in the end. Love how strong this ended for you. Must have! Yay! I'm so happy you enjoyed After the Kiss as well, Keertana. I can't wait for her friend's story next. I felt so bad for her. I'm glad to hear The Outsiders wrapped up the series nicely and without disappointment. That's quite a feat it seems nowadays. The Hallowed Ones didn't even make an impression on me, to be honest. So I wasn't so gung-ho to read this one. I'm happy to hear that it was the better of the two. I am a romance NUT; I am adding After the Kiss to my TBR shelf immediately. Thank you for writing such a great review of it. Yay! I'm glad you enjoyed The Outside. I was a bit nervous about a follow up to the book I enjoyed so much, but I shouldn't have been. Weren't the vampire __ __ __ s fun? :D Heeeee! I really wanted to read The Hallowed Ones but never got around to it because I scare so easily. The fact that it's only a 2 book series and that the sequel is just as good (if a little slow in the beginning) means I will give these a go! I seek Rachel's advice on all things Romance as well! I definitely have Isn't She Lovely on my list, and After The Kiss looks excellent as well. Great character development plus a hunky guy is always a plus. All I want to read these days is Romance, so love seeing your positive reviews. I got approved for The Outside from NG but for some reason it disappeared for formatting issues. I'm glad to see that Katie still retains her values as she goes out in the world. Adore a slowly developing romance, and I'm happy to see that Bickle was able to wrap the story in two book in a satisfying way. Hopefully, I'll find a way to get a copy of this one soon!